It's Fun to Play the Piano ... Please Pass It On! 120 registered members (agraffe, AnnInMiami, AnthonyPaulO, Animisha, Amedeus, ADWyatt, Akaitsuki, alexk3954, anamnesis, 28 invisible), 1,230 guests, and 5 spiders. *How Old is My Piano? 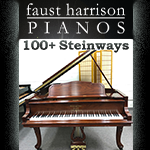 The challenge is that the "best bang for the buck" is probably in the $700-1000 range, but a $2000 piano will clearly be better than one a third of the price, and feel closer to an acoustic piano. That said, no digital quite feels like an acoustic, acoustic uprights feel different from acoustic grands, and each acoustic feels different from another. I highly recommend first trying the Casio PX-160, Kawai ES110, Roland FP-30 and Yamaha P-115, for touch and tone. 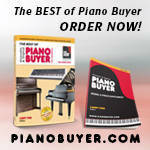 They feel and sound different, but are all popular pianos as they are the entry-level weighted versions for each brand. Each has several piano choices built-in. If you want an "ensemble piano" with hundreds of instruments in addition to the piano tones, plus accompaniment options, then try the Casio PX-360 and the Yamaha DGX-660, which have the same touch and tone as their "straight piano" counterparts listed above. 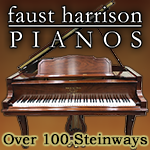 You cannot go wrong with any of the pianos named in this thread, by me or by others. After buying one, don't rethink your choice or consider upgrading for several years, just practice a lot on the one you have. I spend an hour or two on mine every day, see steady progress, and am content with my choice. Good luck! Thanks again, I am going tomorrow to test out the ES110 and FP-30 specifically, but will make sure to look at the others you all have mentioned. Congrats on coming back to the piano after 4 decades away, I'm sure it's a special and very nostalgic/welcoming experience. I have some pretty high quality powered monitors and I prefer the built-in speakers in my ES8. They are excellent speakers. That's impressive. Good to know, thanks! Yes, the ES8's sound, action, amp/speaker, and feature specifications are all superior to the ES110. The ES110 is obviously a lighter instrument, and has the benefit of built-in Bluetooth functionality (although this can be added to the ES8 with a $50 adaptor). If customers favour a lighter weight instrument, the ES110, along with the Roland FP30, Yamaha P-115/P-125, and Casio PX-160. Are arguably the best options. If weight is less of a concern, the ES8, Roland FP90, Yamaha P-255 are all superior to their small, lower price siblings. Thank you James. I'm going to try the more portable line-up and compare to see which fits me best. Thanks everyone, I've watched a dozen or so reviews on the various models and think it's come down to a piano in the $750-$1k range. I will update this thread when I've tried the lineup again. How the action responds to your playing is certainly important, which is a big part of what the sensors do. But, how the action feels, independent of the sensors is also important. If you play, be sure to spend enough time practicing on the floor model to get a feel for it beyond just the first impression. Pianist, teacher, apprentice technician, internet addict. How the action "feels" is not really something that one can appreciate from an online review or video, you really need to play the instruments with your own hands. However, it's perhaps worth noting that the sensor on the ES110's RHC keyboard action is activated by a hammer, rather that directly by the key itself. This is not always the case on similarly-priced instruments. Employed by Kawai Japan, however the opinions I express are my own. Nord Electro 3 & occasional rare groove player. Agree 100%. After doing a lot of research, I really thought triple vs dual sensor was going to be a notable step down in "playability". Have to say after living with the RH "compact" action for the past 6 weeks, that's not the case at all. Thank you James & Steve. Today I'll be playtesting some more. Steve, did you ever look at the KDP110? Did you test it? Would love to know your thoughts especially the key action. Thanks! I didn't try the KDP110. Just spent a lot of time comparing the ES110 to the ES8. I notice the KDP110 has an RHCII action, vs RHC for the ES110. Not sure if it's an "upgrade" or just different because of the overall piano structure. They sure look similar, based on the pics below. Maybe James can tell us how similar they are. Last edited by Steve.L; 04/23/18 12:31 PM. Wow, there's already an RHCII? Kawai sure doesn't sit still on action refinement/variation, do they? After doing a lot of research, I really thought triple vs dual sensor was going to be a notable step down in "playability". Have to say after living with the RH "compact" action for the past 6 weeks, that's not the case at all. I was surprised by this as well. I didn't get a chance to test Kawai's RHC 2-sensor action, but found little difference between Casio's SHA-2 3-sensor, Roland's PHA-4 3-sensor and Yamaha's GHS 2-sensor actions in their ability to repeat notes quickly or play trills at my speed. I do not doubt that players with superior skills may feel the difference, but I could not -- and was quite surprised. Of course, these actions feel very different overall in terms of touch weight, action noise, escapement, etc. Thanks all for your help. I went back to test some of the models today that you all kindly recommended. From the P115, to some Casios, as well as a few other brands I haven't heard of in the same price range. It came down to the FP-30 and ES110, and I can happily say that the ES110 very conclusively fits my preferences for both touch and tone. It took a little while to compare the two side by side. Thank you for strongly recommending for me to go and thoroughly test them vs taking other's opinions above my individual impression. I'll be picking it up this week and can't wait to learn and get used to a sustain peddle and the ability to play expressively. Does anyone have any good experiences with a simple amp to go along with it? Not for a huge audience, more for a little get together in a small backyard. Any insight would be great. I saw a Roland one for $200 when testing the pianos but don't know much about amps and that sort of thing. Thanks! The nice thing about the ES110 is that it comes with a metal-tongue continuous sustain pedal, so you won't have to upgrade from the plastic on-off sustain switches that come with many entry-level pianos. You can always add the optional three-pedal unit if you decide to get the optional wooden stand, but the other two pedals are rarely used, even in classical music. I'm sure you're looking forward to your new piano. Best wishes for continued progress! Last edited by Lotus1; 04/23/18 11:22 PM. Yes, looking forward to also getting the three-pedal unit. However, I think I'm going to try and build a nice wooden console/stand so we will see how that turns out. Thanks for all your help! (and everyone else). Thanks very much for attaching the images of the action. You are absolutely right: When I tried side-by-side with other pianos (some way more expensive, too), I couldn't discern a significant difference between the Kawai ES110's Compact Action and the others. It really is amazing. To be fair, the FP-30 was also very good (and by this, I mean I was able to play as lightly as my novice self could, and it still picked up and responded appropriately). It's hard to find the right words/phrases as I'm not very experienced, but both the FP-30 and ES110 felt great, and I felt I could "speak through them." But the ES110, at a certain point, I said to myself, "This is the one." So I am certainly a believer that 2-sensor and 3-sensor is great for an "on the surface" comparison, but when it comes down to the feel, all that matters is which you feel more comfortable with. Last edited by JoeCB; 04/24/18 10:48 AM. As Gombessa notes, the ES110's RHC action is 2-sensor, while the KDP110's RHCII action is 3-sensor. This is the only difference between the two actions that I'm aware of. JoeCB, congrats on your new piano! Regarding your amp query, $200 is quite a tight budget. I would also be cautious of playing stereo piano sounds through a single mono speaker, as this can result in a boxy/nasally sound. A powered speaker from a reputable brand such as EV may be preferable to an all-in-one keyboard amp. hello being posseseur es 110, I allow myself to intervene, I am for my part extremely disappointed, the sounds are very ugly, the piano sounds are really not pretty ... the amplification is very bad, has 60% volume on a music like the first movement of moonlight sonata beethoven we clearly hear the speakers sizzled on the big chords played, and for my part (perso) I have keys that does not work. this is a personal opinion. I hope to find my joy with an es 8. Miko, with the greatest respect, your unfortunate experience was based on one ES110 instrument that may or may not have been faulty (I don't believe the exact cause of the issues you posted about was ever confirmed, was it? ), and probably does not serve as an accurate representation of the product. Also i think you shouldn't expect top tier performance for 600 €. On german forums i scratch my head about people who can't decide between three low level stage pianos and penetrating the community for weeks about sound/keys/price. Just get more piano if you want better performance. Coincidentally, the manager at the store told me the same thing as you: They recommended a powered/active speaker, particularly the Electro-Voice brand. So I am glad there is consistency there. I will check them out. Sorry to hear you have a defective unit. I picked mine up last night and so far everything is great. The available settings are extensive and I have heard many variations of how you can manipulate the sound, (mellow, bright, adjusting the brilliance, etc.) and it's a little overwhelming to find the favorite one. I hope your ES8/FP-90 fits your needs. I hear the virtual technician on the ES8 is outstanding. Good luck! I see what you are saying, but top-tier performance is relative based on the experience level. I think someone who is a master pianist would find it totally unacceptable to use the ES110 that I just got, whereas someone who is relatively inexperienced such as myself is delighted at the step up from what I had, and I probably wouldn't appreciate "real" top-tier performance for some time as it's so nuanced. In my opinion, spending the time before purchasing a unit has to do with consistency -- if you know what type of feel you like, your next piano can start taking you in that direction to prepare you for the more expensives down the line, etc. I've been reading here (and elsewhere) that a beginner/novice won't be able to appreciate the finer points of a top-notch piano ... so just get a cheap one for starters. I don't agree. I think nearly anyone can feel and hear the difference. Buy a cheap one if economic constraints dictate. Buy a cheap one if you're not sure you'll "stick with it". Otherwise get the best piano you can muster. I see that now, but as I mentioned earlier, at my level of proficiency I was unable to detect a difference between the ES8's triple sensors vs. the ES110's double, so I wonder if the difference between RHC and RHCII won't be comparably subtle, at least to my ears? FWIW, even at my skill level, using the techniques shown in this video, after a little practice, I was able to achieve about 80%-90% of Mr. Estrin's speed on my ES110. Not sure I could do better, even on a real piano. Last edited by Steve.L; 04/25/18 02:35 PM. 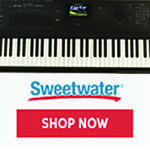 Did you know Piano World has an online store, and that it's loaded with goodies pianists and music lovers want? Check it out and place your order. Entry level piano for around €500? How do I upload songs? PIANO TEACHERS Please read this! Help keep the forums up and running with a donation, any amount is appreciated! Or by becoming a Subscribing member! Thank-you.